"The Horrors" associated with Halloween generally center around mummies, witches, ghosts, tombstones and creepy sounds in the dark. The closest"The Horrors" that I am discussing in this post comes to Halloween is that it pertains to tombstones. The archaic term "The Horrors" referring to Delirium Tremens, can be found on Death Certificate, Mortality Lists, and Church death records of the 19th century and is an archaic medical term. How many times have you been reading a Mortality Schedule or Death Certificate and the cause of death or the contributory cause of death listed is a term that you can not understand? 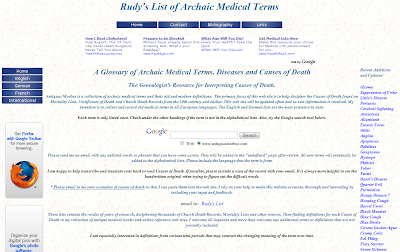 Archaic Medical Terms website provides a very comprehensive list of archaic medical terms along with their modern day counterpart. Not only does this site provide the archaic terms in English, but it also provides a international list of terms from various countries including Croatia, Danish, Dutch, German, English, French, Latin, Portuguese and Spanish to name a few. The webmaster provides an English translation for the terms from the other countries which is most helpful when researching family history from outside of the United States. The webmaster has also expressed that he would be happy to assist in the transcription and translation of a Cause of Death that you have been puzzled with; you just need to contact him via his website and provide him a scanned copy of the document in question. Also he is willing to accept new terms and their meaning to his website and that can be accomplished by contacting him via email as well. Why is it important to know the cause of death of a family member? A person's health history is a good indicator of the possible health problems one might face during their lifetime. Please refer to these posts for further information regarding the importance of and how to conduct a family health history. I also think it helps one to understand the life of their ancestor in a more complete manner. If you would like to browse this website or add it to your book marks, click Antiquus Morbus Home to be directed to the site. Have fun learning!